BAHAWALPUR: Sir Sadiq Muhammad Khan, Nawab of Bahawalpur (1862-1899). bl.uk > Online Gallery Home	> Online exhibitions	> Asia, Pacific and Africa Collections	> BAHAWALPUR: Sir Sadiq Muhammad Khan, Nawab of Bahawalpur (1862-1899). 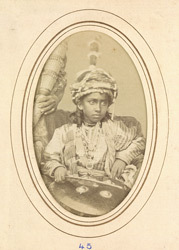 Half-length seated carte de visite portrait, a detail of a larger photograph of Sir Sadiq Muhammad Khan, Nawab of Bahawalpur by Bourne and Shepherd, c.1870. Bahawalpur, located in Pakistan, was controlled by the descendents of the Daudputra family. Sir Sadiq Muhammad Khan (1862-99) succeeded as Nawab of Bahawalpur in 1866. While he was a minor the affairs of state were administered by British and Indian officers. He was created a Knight Grand Commander of the Most Exalted Order of the Star of India in 1880. Sadiq Muhammad Khan's administration developed a canal system to improve irrigation and established a better public education system.